Mr. Scott has beamed up one last time. Perhaps he's sitting with DeForrest Kelley right now, discussing how much they loathed Shatner and his hairpieces. Lord, I hated these uniforms. Ugh. Old school Scotty. The model I grew up with. 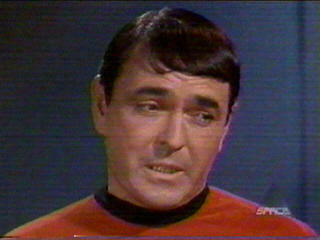 I saw James Doohan once at an eeny-weeny Star Trek convention in Northern Virginia. He was charming and sweet and obviously loved the fans. He was utterly at home with them. He wandered the crowd at his presentation, taking questions and riffing on old stories. A little girl said, "Mr. Doohan, is it true you really, really don't like William Shatner?" And, without missing a beat, Doohan replied, "Oh, yes, honey. It is absolutely true." There were lots of evil chuckles from the crowd. It's sad and terrible and rotten when anyone dies from Alzheimer's and its complications. When a sharp mind is reduced to dust and fear and disorganization, it's angering. I feel for his family. I hope there is some peace now that the end has come. Doohan came to embrace Scotty, and he lived pretty well by embracing that persona. We should all do so well. I know some actors fight typecasting so hard, but, for some, it can bring a lifetime of prosperity and the affection of generations. So long, Scotty. I hope you get a send-off worthy of Starfleet. I would make snarky comments about black lozenge caskets and bagpipers, but I don't feel like it. I'll miss Scotty. Gerry Thomas, the man who invented the TV dinner in Omaha, Nebraska in 1954. Mr. Thomas will be lovingly placed in a shallow disposable tray, nestled in a bed of corn and mashed potatoes, and gently covered with aluminum foil. He will lie in state on a cloth napkin-draped, oversized oak TV tray before his foil lid is vented with a large silver fork and he is cremated in a pre-heated oven, on the middle rack. Rest in peace, Swanson TV Dinner guy. Bachelors and couch potatoes across America owe you so much. I think it is always very sobering for any of us Trekkies when one of the gang passes away. Star Trek made us feel good, and nothing good lasts forever. Dang it. 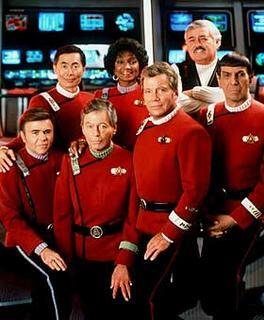 James Doohan was born in Vancouver, B.C. - just a short hop from where I live and he died just a bit south of my city - so in some sense, he felt like a local guy. I wonder if many people know that he didn't really have a Scottish accent? He was just a fine character actor that carried a bag of interesting accents with him, and just so happened to get famous using the Scottish one. There was one incident in James Doohan's journey where smoking saved his life... how many people can say that? Doohan was with the Canadian Military during World War II and had the wonderful (sarcasm here) pleasure of being plopped down in Normandy on D-Day. He took somewhere around six bullets that day. One nicked off the end of a finger - something they never showed on Star Trek. Another hit him near the heart area, but the heavy metal cigarette case in his pocket stopped the bullet. Because of that, he lived and went on to be known by name and on sight to millions of people. Life is so strange, isn't it?